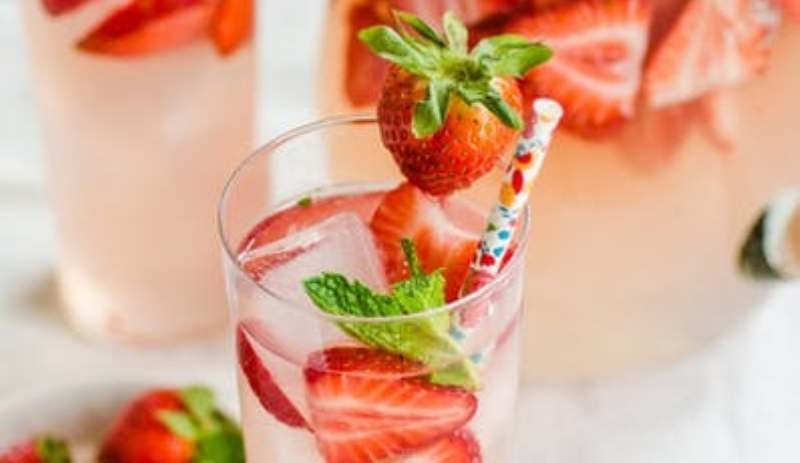 Place the water, sugar, and 6 fresh strawberries in a blender. Blend until smooth. Pour into a small saucepan and cook over medium-high heat until sugar is dissolved. Cool completely before mixing drinks. Drizzle the strawberry syrup in equal parts into the bottom of two tall glasses. Add the lime juice in each cup, a bit of rum extract, then top with ice, chopped basil, and sliced strawberries. Stir well to combine all ingredients. Top off each glass with sparkling water. Garnish with strawberries. To make an alcoholic version of these mojitos, add 2 ounces of rum to each glass before stirring. Enjoy!